The way we – as a profession and industry – were going about things was self-destructive and unproductive. It wasn’t working. Not for us and not for owners. Something had to be done. Together BIM (Building Information Modeling) and IPD (Integrated Project Delivery) would save the day. 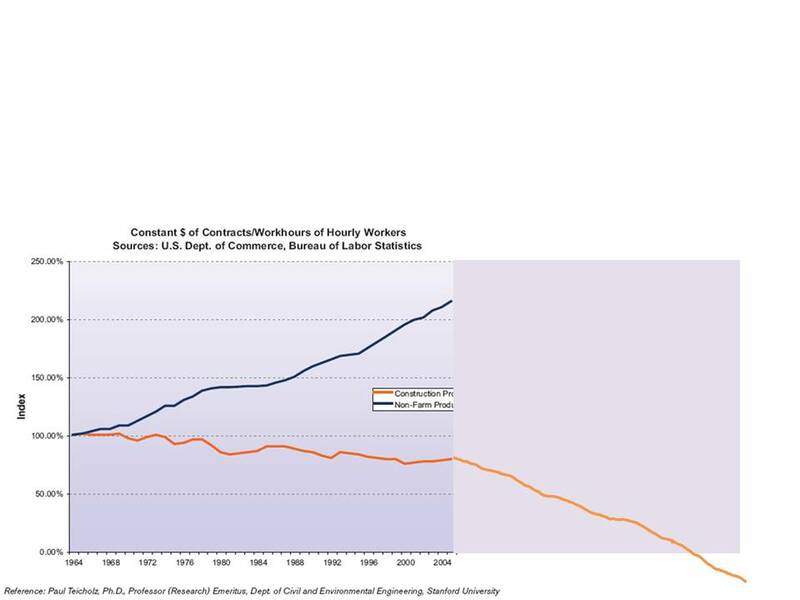 No longer would construction be the lone industry to not see any increase in productivity over the past 40 years. Our troubles would be behind us. Together this dynamic duo would optimize project results, increase value to the owner, reduce waste and cost, shorten project schedules, improve working relationships and maximize efficiency through all phases of design, fabrication and construction. Together, cost overruns would be overcome; delays and late changes would be history. Or so the thinking goes. Take a look at the above chart. 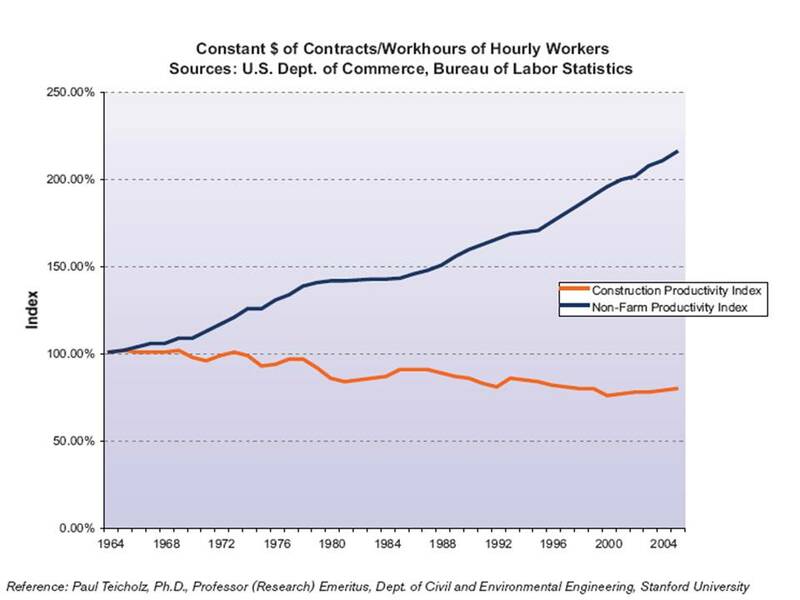 The orange line indicates construction productivity. The blue line, the one edging upward, is everybody else. If you look closely, the above chart takes us through 2004. Maybe 2006. That’s roughly around the time IPD was first being discussed and soon introduced as a full-fledged delivery option. We’re in need of a new chart – to see if BIM and IPD together are working. Are making us more productive. But we know these things take time. We hear every day even if we were to turn on a dime and change our wasteful, harmful habits that global warming would take decades before we saw improvement. It’s a bit like unemployment where we need to create jobs just to stay even. Where even if we were to create 90,000 jobs per month that we would just break even and see no decrease in the current unemployment rate. So why should we expect to see any improvement in the years since this chart was issued? Because we started to work with BIM? Because we have the first evidence of teams working with some success in Integrated Design? No one believes things will take a sudden turn for the worse. This is not even an option. While we need to be patient to see results and an improvement there is still much we can be doing. Unless we want to see our productivity remain flat well into a fifth decade, and accept the consequences, we will have to change. 100% adoption and implementation across the industry of BIM tools and work processes. 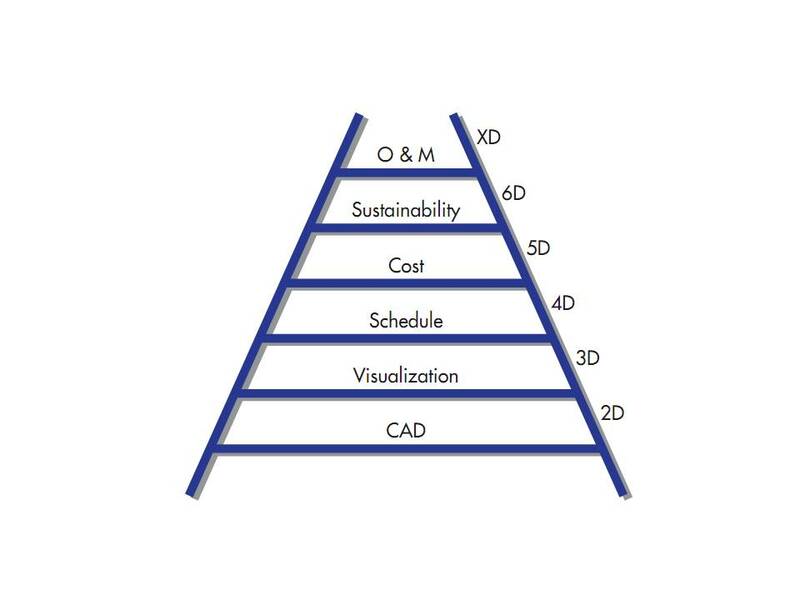 We need to move swiftly and expertly up the D ladder – using BIM not only for the low hanging fruit of coordination but working collaboratively, to reap the real benefits of using these tools on integrated teams. And most importantly, we need to do this together. We need to work for the project – not for our own private gain. With the faith, belief, understanding and irony that when you work for the project, all gain. We need to commit to making our teammates successful and look good and believe that by doing so we will look good as well. We need to give up our self-regard when it comes at the expense of the team and the owner’s goals. We will not suffer any consequences if we maintain this as our mantra heading into the foreseeable future, one blessed with increasing workloads, design and construction opportunities. What’s Your BIM (BusIness Model) Done 4 U Lately? It’s time for you and your organization to rethink your business strategy. This post will introduce a fascinating, far-reaching and beautifully designed book that will challenge the way that you create value for your clients and think about how you approach Building Information Modeling (BIM) and Integrated Design. Changing times and the harsh new realities of doing business in the AEC industry requires all of us to get innovative. BIM especially requires design professionals to be as creative in their business strategy as they are in the design of buildings. Do you know for certain how you can get the most value for the work you are undertaking? Obsolete AEC business models are being replaced by those driven by BIM and the collaborative work process enabled by the technology. For a quick refresher on the current (old) AEC Business Model, turn here, the Introduction to the BIM Handbook. There are of course several BIM business models – determined by what phases you work in and the chosen delivery method. Here’s a free 19 page handout from his presentation. You might recall Jonassen is the author of AIA’s seminal Changing Business Models in BIM-Driven Integrated Practice, here included in the Report on Integrated Practice series. The thing is, we’re living in unprecedented times. We all need to be creative in how we go about serving our clients – and getting paid for the considerable work that we’re doing. Doing the same thing, taking the same approach, over and over, irrespective of the client or situation – whether stylistic sense or business sense – no longer works for the design profession and construction industry. Coming-up with a creative BIM business model is a great start to assuring that the client is satisfied and you walk away with a profit. To be creative in your BIM business strategy it helps to know what your options are. It also helps to know how others have approached similar business situations so that we can learn from them. That is where this magnificent new book comes in. Building Information Modeling, meet Business Model Innovation, that is. 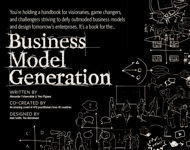 A self-described handbook for visionaries, game changers, and challengers striving to defy outmoded business models and design tomorrow’s enterprises, Business Model Generation is a model book for those who communicate design ideas for a living. In short, BMG is a very practical and accessible tool to analyze and improve you and your business. 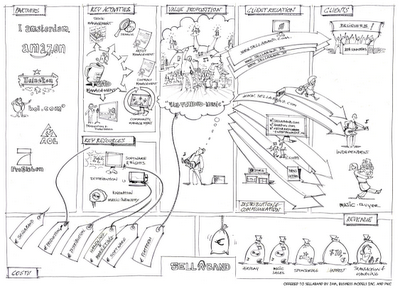 What is your organization’s business plan? Whether you have one that is outmoded or don’t have one, you need this book. How do you plan on leveraging BIM? How do you plan on leveraging IPD? Making the work process work for you financially is what this book will help you accomplish. Are you getting paid for all the extra work that goes into your BIM models? If not top of mind – if your answer isn’t on the tip of your tongue – then this book’s for you. This book will help you launch, re-launch or advance your career and business from a value creation standpoint. BMG is an indispensible manual on how to map, analyze, and strip-down your organization’s business model and reassemble it into something that creates real value. For me, there are three undeniable benefits brought about by this book that compel me to recommend it here in a BIM and IPD blog. 1. Like IPD, the book follows its own advice and was written collaboratively – by a team of 470 practitioners (co-contributing co-creators) in 45 countries. 2. Business models, like building models, come in many shapes and sizes. You will recognize many of the books and cases mentioned in this book – and learn things about them that you didn’t know. This book will re-familiarize you with the most popular models – and encourage and inspire you to come up with your own – one that will work best for you or your organization. 3. The book is stunningly beautiful to look at – both rough and polished, well-designed – it will inspire; has the look and feel of Francis Ching’s books from the 70’s. It would be a sin to read this book on a Kindle or iPad. This one you have to feel in your own hands. The book is no stranger to visual and architectural design: one section of the book is entitled Patterns, and opens with an architect Christopher Alexander quote. 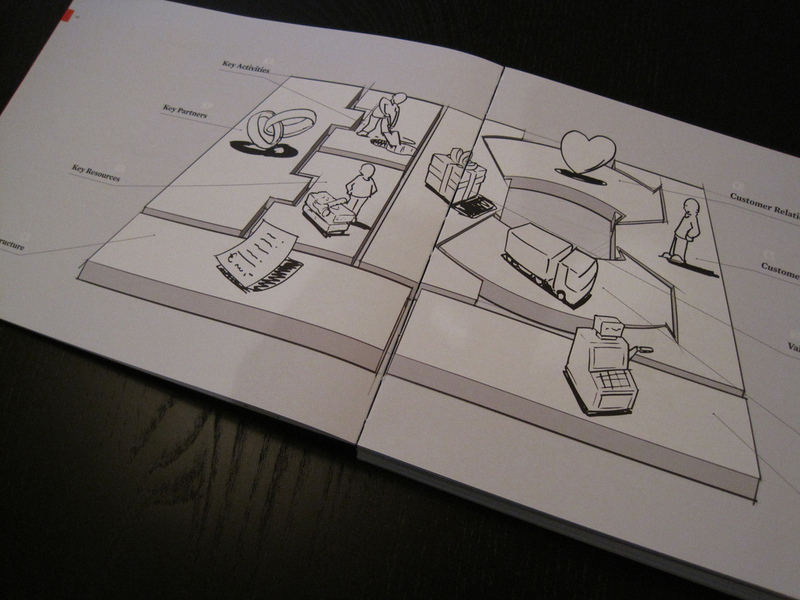 The book was designed by The Movement http://www.thmvmnt.com/ a Global Change Agency that creates with people. In the interest of brevity, I won’t review the book here. Life is short – read it. Still not convinced? For a summary see the following links and “About the Book” below. Considering going back for your MBA? This book will provide you with all you need to know for an MBA in BIM. Order this paperback book here. Get a taste (a 72 page PDF preview) of it here for free. Read co-author Alexander Osterwalder’s blog. Disruptive new business models are emblematic of our generation. Yet they remain poorly understood, even as they transform competitive landscapes across industries. 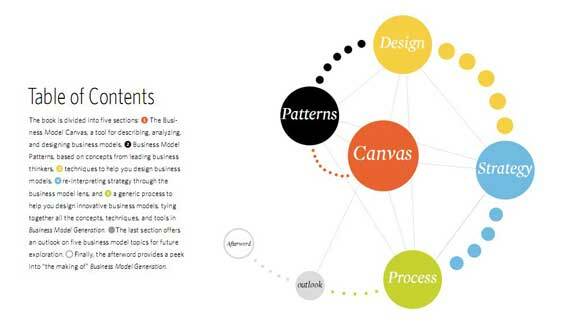 Business Model Generation offers you powerful, simple, tested tools for understanding, designing, reworking, and implementing business models. 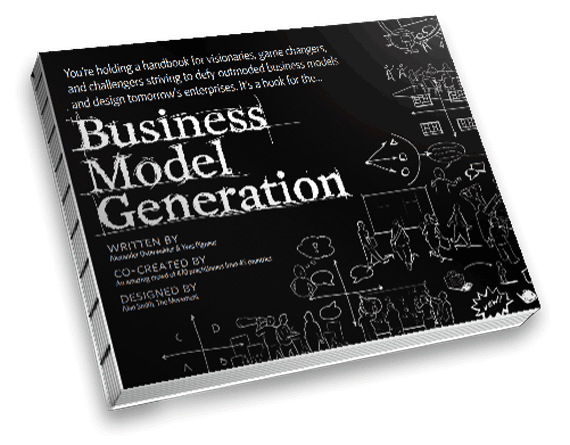 Business Model Generation is a practical, inspiring handbook for anyone striving to improve a business model — or craft a new one. Business Model Generation will teach you powerful and practical innovation techniques used today by leading companies worldwide. You will learn how to systematically understand, design, and implement a new business model — or analyze and renovate an old one. Business Model Generation is for those ready to abandon outmoded thinking and embrace new, innovative models of value creation: executives, consultants, entrepreneurs — and leaders of all organizations. * The Ultimate Competitive Advantage: Secrets of Continually Developing a More Profitable Business Model by Mitchel, Coles, Golisano and Knutson, has a heavier focus on marketing with some ideas and questions relating to one-sided business models, so if you are looking to “sell more” perhaps you like this book. * The Profit Zone: How Strategic Business Design Will Lead You to Tomorrow’s Profits by Slywotzky, Morrison and Andelman, has a heavier focus on profitability and the changing areas in which high profit is possible to keep, it is a quick read and perhaps complementary to The Business Model Generation that focus less on profitability. * Open Business Models: How to Thrive in the New Innovation Landscape by Henry Chesbrough has a heavier focus on technological innovation in the context of business models and also covers the important area of Intellectual Property in relation to open business models. * Getting to Plan B: Breaking Through to a Better Business Model by John Mullins and Randy Komisar, focus more on entrepreneurship and start-ups and on learning from experimentation and adjusting the business model, also with more focus on financials. While the architectural design process is largely an intuitive exploration, what happens to intuition in this rational, digital process we call BIM? Most everyone in the AEC industry by now knows that the purpose of a building information model (BIM) is to generate and manage building data during its lifecycle. And that the model’s data – in the form of information – covers building geometry, light and energy analysis, geographic information, quantities for estimating costs and properties of building elements. But what if the BIM was used to contain acquired knowledge, build intuition and generate insights? After attending two critical AEC-related events in Chicago in one week – Christopher Parson’s seminal KA Connect 2010 conference on Knowledge Management, and Illinois Institute of Technology’s Divergent Perceptions Convergent Realities: IPD and BIM – I started thinking about how BIM models, as a technology and process still very much in a nascent state of development, had the potential to impact the modeler’s, designer’s and even end user’s knowledge, wisdom and intuition. Today, especially in this economic climate, the BIM is very much a rational model. And while most would agree that one model is not a realistic end goal or even an ideal, what if what we were working toward were multiple models – rational models, intuitive models and rational-iterative models – all assisting in our individual and collective professional judgment and decision-making? where each term is differentiated – and evolves – from an evaluation of its immediate precedent and antecedent. Read more about this and systems thinking here. That the succession of terms, when stacked, forms architecture’s primordial building form – the pyramid – is almost perverse. At the IIT colloquium, esteemed Assistant Professor John Durbrow raised the question as to whether intuition could be defined as the successful outcome of internalizing one’s own experience over time? Aaron Greven at the IIT colloquium argued that intuition-based design is being replaced with analytic-based results, creating greater certainty for owners, translating as lower risk, with an emphasis on accountability by the design professional. For evidence of this, see HBR’s The Future of Decision Making: Less Intuition, More Evidence. But what if our models were able to contain both analytics and intuition-based parameters, resulting in an analytic-intuition model? It is a dirty little secret that architects design what they like and only justify later. They do what they do because they like it – and work hard to provide reasons for their intuitions in the socializing or coming-out of their designs. Architects self-justify and rationalize, then justify and post-rationalize. One could argue that all-in-all the world is a better place – with much better buildings – for having taken this approach. Here’s the nuance in this argument. What an architect likes is not inherent to the architect – not something she is born with – but something learned, nurtured and inbred, over time, through trial and error and the school of hard knocks. The successful moves rise to the top while the not-so fall like lead to the bottom, seldom to rear their ugly little heads again. Or one would hope. Over time what we call professional judgment or experience is merely the accumulation – and recollection – of such positive feedback over time. Forget for a moment about what this says about our freedom to choose and the faintly behaviorist underpinnings. What does this have to say about BIM and how BIM might be taught in schools? It is often argued that undergraduate students ought to be immersed in building construction early on and once familiar with how buildings come together, only then introduce digital technologies such as BIM. Others, of course, believe that there is no place in the curriculum for BIM and it ought to be picked-up on the sly. Several at the IIT conference expressed concern that students were being exposed to BIM earlier and earlier in the curricula. Once ingrained, acquired building knowledge and building wisdom would result – through the iterative and social process of an integrated design studio – in intuition. Some inevitably would argue that intuition is the result of years of trial and error – and wouldn’t be developed until long after school has ended and professionals were well into their careers. Perhaps. But if – as some have said – that architectural education ought to focus on educating future architects for their long careers and not to be employable interns day one out of school, then immersing architecture students in the model to learn modeling AND construction – how buildings come together – would make some sense. This is the building model at its most elemental form, involving pre-information in the form of symbols. Read more about it here and here. 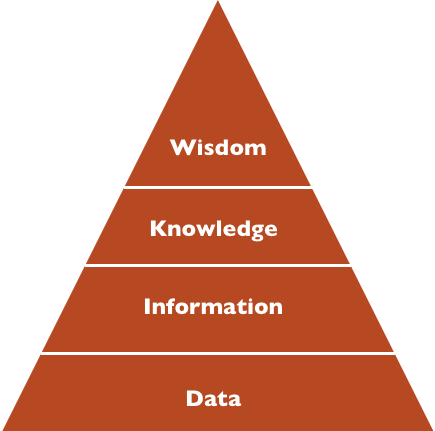 Where information is neither the accumulation nor collection of data but represents the next level of information. Knowledge-building activities and even decision-making models may exist in decision theory – but not building knowledge models. Knowledge is putting information from the model into action. Think of it as applied information of the BIM model. The next morning after drafting this post, T.J. McLeish, IIT College of Architecture Virtual Realms, in his colloquium talk on Planning Tools/Digital Design and Fabrication- a self-proclaimed advocate for making smarter people not smarter buildings – rhetorically asked is it building information modeling or knowledge modeling? No doubt a convergence of perceptions. One of the primary purposes of any model is to build intuition and generate insights. Typically, a model is developed to be able to better understand phenomena that are otherwise difficult to comprehend. Models can also help in verifying the correctness of an intuition or judgment. In spite of the fact that many educators and practitioners recognize the intuition-building power of simple models, this is the first book in the field that uses the power of the basic models and principles to provide students and managers with an “intuitive understanding” of operations management. What if a BiM were to result in the modeler’s intuitive understanding of how buildings come together, how they ought to be sited, how they impact the entire lifecycle, which designs work and which are better left in the monitor? It is worth a longer look into the role of intuition in design, BIM and IPD. Have you ever noticed that every technology conference starts with difficulty advancing slides? Can you really fault those who might have benefitted most by attending for wanting to spend an all-too-rare beautiful Chicago Spring Saturday out of doors instead of in the dark and noisy basement of IIT’s Crown Hall on Chicago’s South Side when there have been a seemingly endless succession of dismal Winter Saturdays when the event could have taken place? Yes you can. The atmosphere was admittedly a bit like educating the educators. No matter – the presenters and presentations more than made up for calendar and Crown Hall’s less-than-accommodating underbelly. That the event was memorialized on video – one can only hope that the presentations reach a wider audience once uploaded. Since Sachin Anand, dbHMS Envisioning Energy Flux, representing building systems was not able to attend, Joseph Burns, Thornton Tomasetti, hot on the heels of his recent AIA podcast with Markku Allison revisiting his 2006 insights on BIM and IPD, spoke about Structure not Unseenly, a show-and-tell of his recent work with little critical assessment. David Bier, Futurity provided a much-needed GIS-level view of applying landscape to the BIM environment on Data Systems for Engaging the Environment. A great deal of minute detail was presented, sometimes losing sight of the forest for the trees. T.J. McLeish, IIT College of Architecture Virtual Realms, in his talk on Planning Tools/Digital Design and Fabrication – who, along with all of the faculty presenting and in attendance an alumnus of Murphy Jahn, making the event something of a MJ reunion – explained how he doesn’t see clear-cut boundaries between virtual and non-virtual realms. His interests, he said, fall in the intersection between the real/physical and abstract/digital worlds – and how we translate, manage and move from one to the other. He went on to present a number of research projects he is involved with that have very real applications. While all interesting, the divergent talks could have benefitted from time to time with a reference back to the topic of the day: IPD and BIM. Keith Besserud, Studio Head [BlackBox] at Skidmore, Owings, & Merril, LLP, also evoked Mies in his talk on Form Follows Data. Keith described BlackBox an applied research studio in the Chicago office of SOM (started back in the glory days of 2007 when firms could still afford R&D,) focusing on developing and leveraging parametric, algorithmic, and computational design methods and tools in the design work of the office. Keith gave an inspiring, if canned, talk on his recent work. Interestingly, what resonated and lasted long after he was finished speaking, was a short digital video illustrating the understanding of wind performance around tall buildings. A model for a Building Understanding Model? Yes, analytic tools such as Ecotect, take some geometry and look at behaviors in two different locations in the world. Bottom line: Analytic, yes – but also breathtakingly beautiful. Neil Katz, also of SOM Blackbox, the last presenter (alternatively, Open Visions, Vibrant Visions, and Algorithmic Modeling/Parametric Thinking) before the closing panel discussion, reminded us –in action if not words – that, while IPD and BIM is first and foremost about delivering more efficient results to owners, what attracted us to the field in the first place was the pursuit – and creation – of beauty. His vision presented in creative computational solutions to design problems, is a beautiful one. His work is faultless, beautiful. Neil came across as a gentle soul who spoke without ego or any of the pretensions normally associated with the worst of academia or working in a large competitive firm. That such beauty can result from such circumstances – and after so many years of practice – ought to provide manna for those who wish to continue on their chosen career path despite the many changes and hardships. Intuition is the assimilation of observations made over time, to see what seems right. You’ll develop intuition based on the performance of digital tools. How do you teach intuition? How do you demonstrate intuition? 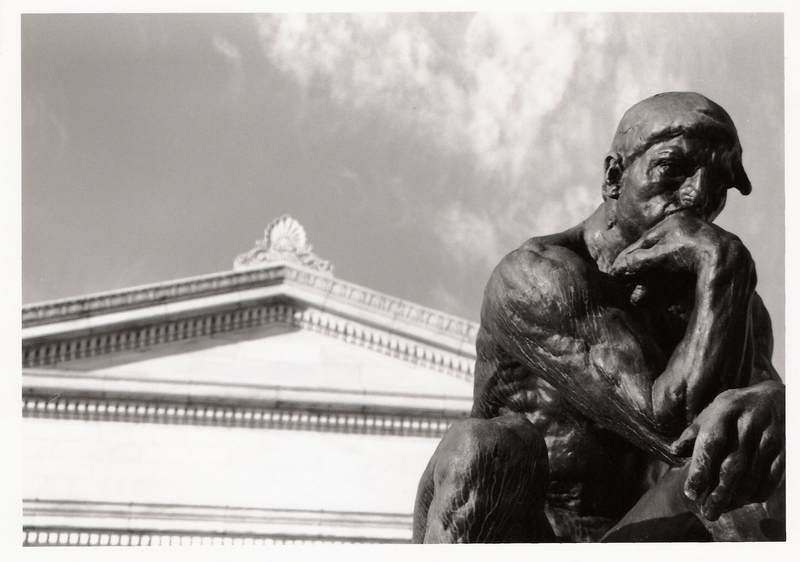 How do you test, validate and evaluate intuition? It’s just a hunch but perhaps the answer is in a Building intuition Model (BiM)?